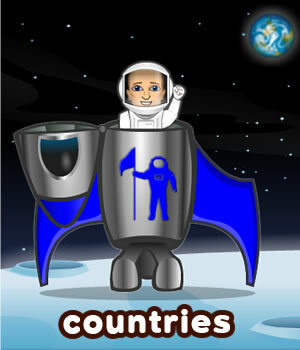 Teach children the names of countries and how to introduce themselves by their nationality. For those whose countries are not mentioned in the lesson, it provides an opportunity for them to start asking similar questions about their country of origin and nationality. 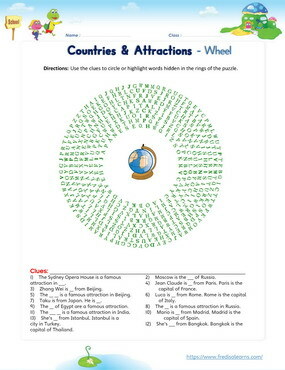 The lesson also helps EFL/ESL young learners to not only learn the names of countries but to identify major attractions across countries of the world. After this English lesson, every learner should, at least, be able to introduce themselves by country and by nationality. The worksheets below are useful for offline and classroom activities. 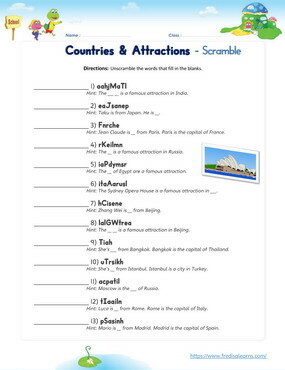 These printable exercises directly correlate with the above lesson 'Countries Attractions'. Every worksheet comes with an answer sheet on the second page for educators. It is a special day in school as Miss Ann has invited students from different countries to join Freddie and the other classmates in talking about their countries of origin. Students from China, Japan, Australia, Russia, India and Italy are called up to introduce themselves and their countries of origin. They also identify a major attraction in their countries and tell others a brief history of these attractions. Freddie gets to ask many questions and is thankful to Miss Ann for such a cool lesson. I am from China. I’m Chinese. I am from Japan. I’m Japanese. I am from Spain. I’m Spanish. I am from Turkey. I’m Turkish. I am from Russia. I’m Russian. Zhang Wei is a student from China. In Beijing, you can see the Great Wall. The Great Wall was built to keep out invaders. This is China on the map. It shares borders with Russia, India and Vietnam. Ms. Ann: Boys and girls, today we will meet some students from other countries. They will tell us about their countries. Ms. Ann: Zhang Wei is from China. Zhang Wei: Yes. I am Chinese. We have The Great Wall of China. Zhang Wei: It is a very big wall. It was built to keep invading countries out. Ms. Ann: Thank you, Zhang Wei. Now let’s hear from Lakshmi. She’s from India. Lakshmi: I am Lakshmi and I am from India. I am Indian. Freddie: Are there any cool places where you live? Lakshmi: We have the Taj Mahal. It was built by an old emperor for his wife when she died. Freddie: What is it made of? Lakshmi: It is made of white marble. It is very beautiful. Ms. Ann: Thank you, Lakshmi. Now, let’s hear from Luca and Elena. Luca: I am Luca. I am from Italy! I am Italian. We have the Leaning Tower of Pisa. Freddie: The leaning tower of pizza? Luca: No, though we do like pizza! It’s the Leaning Tower of Pisa! Ms. Ann: What about you, Elena? Elena: I am Elena, and I am from Russia. I’m Russian. We have a strong fortress called the Kremlin in Moscow. Freddie: What is special about the Kremlin? Elena: It is very beautiful, and it keeps invaders out. Freddie: Oh! Like the Great Wall of China! Ms. Ann: Yes, but they are in different countries. Thank you, Luca and Elena. Let’s hear next from Matilda and Haruto. Matilda: I am Matilda from Australia. I’m Australian. We have kangaroos and koalas! We also have the Sydney Opera House. Matilda: The Sydney Opera House is a place where people perform. Haruto: I am Haruto. I am from Japan. I am Japanese. Ms. Ann: What is there to see in Japan, Haruto? Haruto: Well, there is Mount Fuji. It’s a very large volcano. People like to climb it! Ms. Ann: Thank you, boys and girls. Freddie: This was a cool lesson, Ms. Ann!